2013 was a great year for the swimming pool industry and creativity seemed to be key to stand out last year. What can we expect to see in swimming pool trends and design this year? Let’s take a look at what 2014 swimming pool trends we can expect to see. Swimming pool installations are on the rise due to the last few years of creative designs accenting home architecture. This has created a renewed spark in outdoor fun right at home. This means more time with the family and more time at home rather than expensive vacations. Glass Tiles – One of the newest and most aesthetically pleasing swimming pool design trends for 2014 is the addition and use of glass tile. Glass tile is quickly gaining strength and use over tried and true ceramic tiles. Glass tiles are impervious to common problems associated with ceramic tiles. 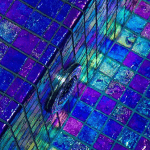 Glass tiles are harder than normal ceramic tiles and therefore are harder to crack or break. Pool tile has been placed under the coping to highlight the water’s edge since the beginning of swimming pools. Today, glass tiles come in a myriad of colors and finishes to complement any backyard pool. Glass tile is now used to accent the water’s edge, the hot tub area and even inside the pool. Attached Hot Tubs – Swimming pools and hot tubs have seem to go hand in hand these days. Attaching the hot tub to the swimming pool has gained extreme popularity recently in swimming pool designs and we can expect to see them in the line up of 2014 swimming pool trends . Today’s hot tubs are accented with glass tiles and spill over features. The newest trend is not putting the hot tub in their traditional spot connected to the side of the swimming pool. Recent swimming pool designs have seen a growing interest in elevating the hot tub to gain a better view of the swimming pool. One of the other growing trends is the make the hot tub appear “invisible” in the design. These hot tubs are placed with walkways in the swimming pool or with negative edges on the side of the pool making an awesome effect that is very inviting to guests. Hardscapes – While the word itself may be a bit rough for a smooth tranquil setting of your backyard oasis, hardscapes in 2014 are actually complimenting this design. Rather than the standard grey concrete or even stained concrete, 2014 swimming pool trends suggest the use of pavers, tiles, stamped concrete and travertine tiles. The beautiful thing about travertine tiles is no matter how hot the day, they stay cool to the feet. When you add a decorative surrounding and pool lip you actually invite the eyes to the oasis in front of you. Pavers are also an excellent choice as they offer great drainage, maximum traction and minimize moisture. Pavers are an excellent option for that rustic brick feel. Build your backyard design to accommodate your needs. Geometric Design – Don’t be a square man. Pools have pretty much kept to the same form over the years but recently theres been a break in that trend. 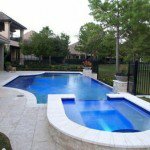 While most designs are still simple and subtle people are bending the rules and adding design elements that compliment their homes or yards for a true custom pool feel. One that was designed for you and one your neighbor will definitely not have. These designs will stand the test of time as they match your existing design features and add to the feel rather than take away from it. Go Big At Home – Now this doesn’t mean to build the biggest pool you can. We don’t want to give up our entire yard for a small lake, well some of us might. 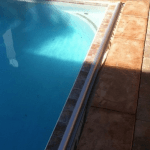 However we are talking about a pool that truly fits your yard but is full of custom features. These features include water jets spraying across your yard landing in the pool making an incredible visual spectacle. This includes caves or grottos that look like natural rock, water falls or beach entries. This also includes proper lighting. you want to light up the pool and surrounding landscape in an ambient non obtrusive way. Something that doesn’t necessarily draw your attention away from your focal point but compliments it instead. 2013 was a great year for the swimming industry. We noticed a spark in outdoor activities being kept with the comforts of home. 2014 swimming pool trends will push the envelope for creativity and design. Creativity seems to be the only limit when it comes to swimming pool trends for this year but luckily we at Deep Blue Pools have been following these trends and are way ahead of the game. We are excited for what this year has to bring as well as what we will see for 2015. What trends do you expect to see arise for 2015?